Analytical Armadillo: Ignore Annabel Karmel says the Analytical Armadillo! Ignore Annabel Karmel says the Analytical Armadillo! Since when did Annabel Karmel get a medical degree? In fact a quick Google of Annabel's qualifications didn't clarify on what authority she is urging mums to ignore official weaning guidelines as outlined by the Department of Health? "Ignore official weaning guidelines, says Annabel Karmel"
"Mothers should ignore Government advice not to wean their babies before six months to help expand their taste for different foods, according to Annabel Karmel, the 'Delia Smith' of baby food." The first paragraph alone either demonstrates a clear lack of understanding regarding breastfeeding (ie that infants are exposed to flavours via breastmilk), or assumes that all her readers are formula feeding. Even then there is no evidence to support this theory. "Breastfed babies get a variety of flavours in their mother's milk and are known to be more receptive to a range of tastes once solids are introduced. They do not need experience of the food itself beforehand to be able to enjoy it at 6 months"
She said "official guidelines that stipulated exclusive breastfeeding to six months, based on World Health Organisation (WHO) recommendations, were misplaced in a developed country like Britain where people knew the importance of sterilisation." Ah so the Department of Health is wrong, they obviously never considered the UK knew how to sterilise when they set the guidelines! Doh, quick someone get on the phone to them. Of course sterilisation is significant, but Annabel's comments again demonstrate ignorance as to the further reaching impact of solids. We know introduction of anything other than breastmilk to the gut, changes the bacteria that resides there and that this can impact on health. 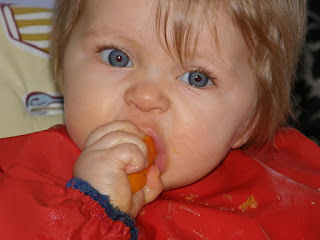 And she said "the advancing science of baby nutrition was rapidly proving them to be obselete and counterproductive"
She said: "We have this window of opportunity when babies eat pretty well, from six to 11 months, and we really need to introduce as many flavours then as we can." Woah hang on, I thought we were ignoring guidelines because babies needed some "flavour exposure" earlier? Yet 6-11 months is six months - plenty of time for them to have a huge range of flavours if they are included in normal family meals from the start. "That meant prepping them before six months to take full advantage of that window", she explained. Prepping them? How exactly does one "prep" a baby to eat? Get them to have a flick through the Good Food Guide? 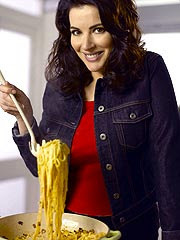 Play pre-recorded episodes of Nigella? Attacking the guidelines, she said: "In a developed country like the UK where we know about sterlising milk bottles and preparing food in a hygenic way, there's no real risk of weaning before six months." "No real risk"? Even if we went along with that (which let me be clear as discussed above I don't!) no real risk is very different to "lots of benefits to". There's lots of things in life that don't propose a "real risk", but that does not by default make them desirable or essential. "Simple foods are absolutely fine," she said, recommending fruit or vegetable purees. What Annabel also fails to consider is that evidence strongly supports the notion that solids displace the infant's milk. Even if they are given at the end of a feed to "fill extra space", overall intake of milk has been repeatedly shown to reduce in response. So essentially what Annabel is supporting is swapping calorific fatty breastmilk, full of immune properties, for some carrot mush? We know infants absorb iron less effectively once they consume something other than breastmilk, which is why many experts now say an infant's first food should be iron rich. "Some babies would be ready to wean sooner than others and she argued that, when it came to deciding, mum knew best." I agree some are ready sooner than others, and if mums read the guidelines fully and understand them; they will recognise that readiness is indicated by putting food into the mouth and eating it, not night waking or breastfeeding more frequently - babies absolutely know best! According to Department of Health guidelines, "mothers who wish to introduce solids before six months should always talk to health professionals first". But Mrs Karmel said: "I think as a mother you kind of know what your baby needs. You are best placed to understand." "You can talk to your health visitor, but anybody who knows anything about baby nutrition will say you can introduce solids from 17 weeks." Is Annabel seriously implying that even if a Health Professional suggests it's not the best idea, it's fine to ignore them because "anybody who knows anything about baby nutrition" (well clearly except for the Department of Health, The World Health Organisation, UNICEF etc) state it's fine? Who exactly is "anybody who knows anything"? She went on: "There's no evidence that introducing food from 17 weeks makes a child more prone to allergies, provided it's very simple." "Many babies at four to six months cried because they were simply hungry and not nutritionally satisfied with milk alone." Which babies? Who decided they were crying "simply because they weren't satisfied"? This is purely an opinion statement written as fact - unless of course I missed the journal that printed Annabel's research into this area? "Mrs Karmel, who has just launched a new iPhone 'app' to help parents feed their children, added that she was dismayed that so many resorted to jars of sterilised baby food." Attention has centred on Mrs Karmel's beef lasagne, which contains 5.4g of sugar per 100g of weight. This is double the sugar found in a similar product for adults. The same ready meal contains 1g of salt per pack, half of the entire daily recommended maximum for a child aged one to three. The lasagne and cottage pie contain added sea salt despite a Government recommendation that parents cooking at home should not add salt to meals for toddlers. 'There is little point in making a meal that children will not eat. If healthy alternatives are bland and children refuse to eat them, frustrated parents may well turn to chicken nuggets, pizzas and pot noodles." Has the Delia Smith of the children's culinary world not heard of herbs and spices? Which is it - mother knows best, or mothers are quick to give junk food? Forgive me if I'm not lining up to take nutritional advice from someone who feels food that isn't heavy on sugar and salt, and is vaguely healthy is "bland". All that aside, seriously an iPhone app to help parents feed their children? for real? How on earth did the human race manage pre iPhone? 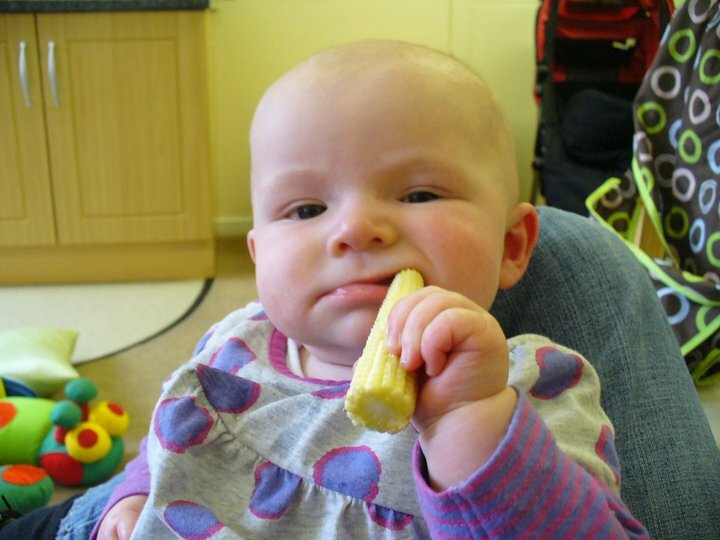 Her stance on weaning is backed up by research, published in January in the British Medical Journal, which called for existing advice on breastfeeding and weaning to be reassessed. Ah yes the research published in January - the research that brought no new evidence whatsoever to the table and purely noted they think some areas should be restudied. The same paper that declares three of the four authors "have performed consultancy work and/or received research funding from companies manufacturing infant formulas and baby foods within the past three years". I guess baby led weaning must really bother those who profit from infants starting solids. Simply including baby in mealtimes, offering them a selection of home cooked food to eat when ready really isn't that profitable to those who sell outdated advice telling mums how to squash a banana and add milk to a strict routine. That's sooo last century dharling! Here's a few starting solids photos from the Facebook gallery - note babies eating solids not laden with salt or sugar and not a pot noodle in sight! 2. I didn't need any food in jars etc. We could use baby-led weaning and all eat the same thing. So basically as a consumer of Annabel Karmel products I was a complete loss. I suppose she needs to convince herself of these things in order to justify her business to herself - and of course still make money. As a doula I am promoting babyled weaning to all of my clients and am working hard with the hospitals, mw's and health visitors in the yorkshire area to educate and reassure them that BLW is a safe and healthy alternative to mushing food. I did it for my little one and she LOVES her food!! My nephew was weaned at 6 months old - not BLW - and as a result he has IBS and will have it for the rest of his life. No it wasn't his parents, it was the nursery he went to - and they supposedly had childcare training. 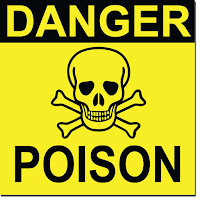 He can't have most raw fruit and veg other than bananas and even cooked he has to be careful. So, all in all, Annabel has no idea what she is going on about. 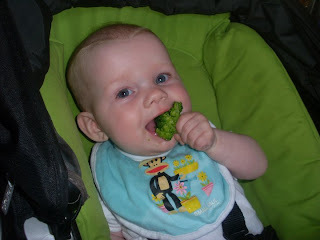 My siblings and I were all weaned by BLW and all of us are perfectly healthy. If children are hungry they will eat - they follow by example. So if you eat a variety of foods with them they're more likely to copy and explore different tastes. 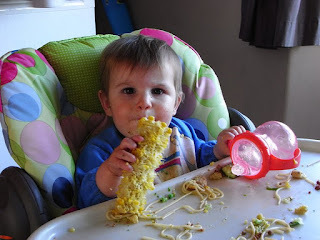 We started feeding our kids solid food (not out of a jar) from about 3 months and it worked out just fine. But we must not let this get in the way of a good conspiracy theory about anyone who makes baby food. I know what you mean Mark! My gran smoked 20 a day until she died at a ripe old age of a non smoking related illness - but those health agencies with their pesky tobacco conspiracy theories eh! I think the ruddy journalists should take some responsibility for publishing this twaddle too. Idiots. Not to mention the other DOH guidelines for weaning which include the baby being able to sit up by themselves, reaching out to pick up their food and eat it without pushing it all out of their mouths. 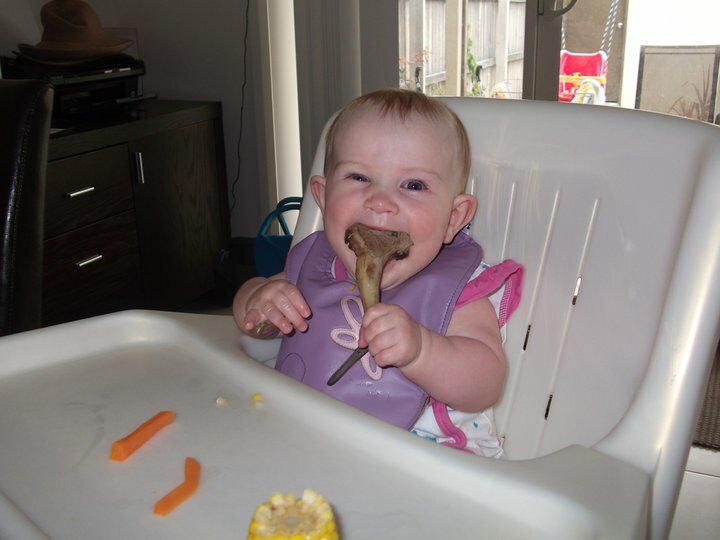 To me a clear way of telling baby's ready for solids. Let's not forget Karmel's previous association with Nestle as well. She makes my blood boil. Great piece! Well written. If only you could get it published too. Annabel K has failed to answer my questions on the sugar content of her 'wholesome' snacks which contain up to 25% refined sugars. Shocker that she ignores anything which challenges her somewhat misinformed view point. I've weaned three children onto solids (from breast milk) without having to introduce refined sugars or white flour/pasta/rice because neither are nutritionally beneficial in any way. Ms Karmel cares not about the health of our children and only about the money pouring into her pockets.